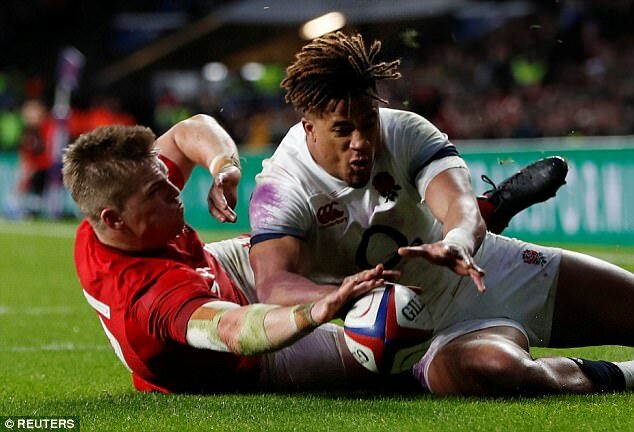 On 23 minutes, with England 12-0 up, Wales thought they had scored a try through Gareth Anscombe but after a Television Match Official (TMO) review lasting one minute and 45 seconds, the score was controversially disallowed. With a penalty coming Wales’ way, fly-half Rhys Patchell kicks to the left corner for wing Steff Evans to chase. The ball bounces off Evans’ left knee and bobbles into the in-goal area. Anscombe and Anthony Watson both dive for it but it is uncertain who grounded the ball first. The law book was simplified at the end of 2017 but this is still a grey area. The phrase ‘downward pressure’ — often quoted when it comes to grounding the ball — is not in the rules any more. a) By holding it and touching the ground with it; or b) By pressing down on it with a hand or hands, arm or arms, or the front of the player’s body from waist to neck. ‘I felt some pressure of the ball on the ground, I thought that I got it down but the decision didn’t go our way. That was disappointing because it potentially would have changed the momentum, but ultimately it was still early on in the game and we had a lot of chances to fix it. ‘The TMOs don’t always get it right, which is frustrating but you can’t do much about that. We were confident once we saw the first replay, but whether there was a bit of a breakdown, there might have been. Newman is from Auckland, New Zealand and began refereeing in 2003. He was also in charge for the Italy v England match but is not listed to be the TMO for any other NatWest 6 Nations matches. The incident will be flagged up by the Welsh Rugby Union to World Rugby and the referees’ chief Alain Rolland. In the past World Rugby have admitted in private to coaches that the wrong decision was made, but it is very rare for referees or TMOs to respond to questions about their decisions.